The 1967 and 1968 Canadian produced train sets have been the most difficult to document owing to both the lack of documentary evidence and the lack of surviving sets. the set production of this period; albeit currently still a work-in-progress in some areas. Following the Lines Brothers takeover of the collapsed Meccano Ltd. empire, 1966 had seen the newly formed Canadian company of Meccano-Tri-ang Ltd. relocate from Quebec to 270 Islington Avenue South, Toronto, Ontario. 1967 brought a further relocation to 95 Brown’s Line, Toronto 14, Ontario. This allowed the company to combine the storage of Tri-ang products with those of Meccano Ltd. In order to comply with Canadian taxation law, Meccano (Canada) Ltd. had set up an independent wholesaling company in the name of Roland G. Hornby Ltd. It now took over the wholesaling of Tri-ang products as well. The Brown’s Line premises would remain the headquarters for Canadian operations until the break-up of the Lines Group in late 1971. 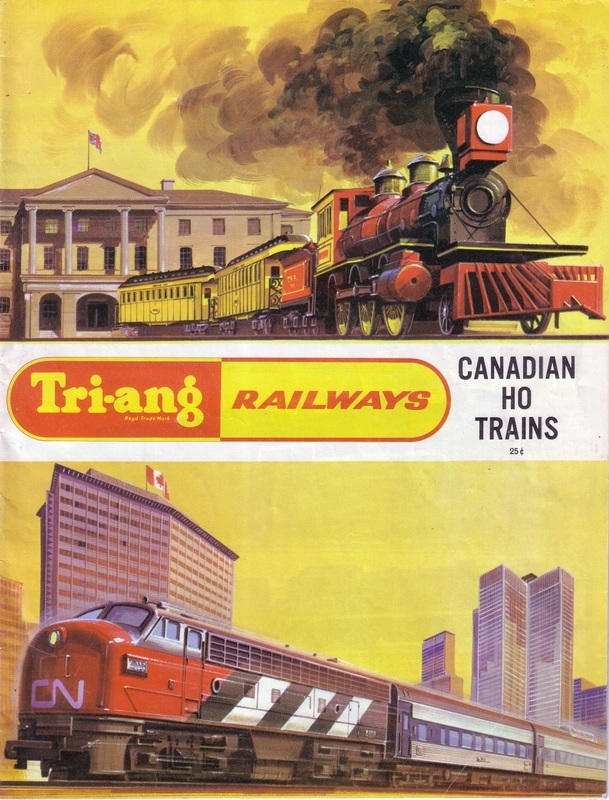 The issue of the Tri-ang Railways 1967/1968 Canadian Catalogue heralded the launch of the new season, which traditionally started in August, with an important expansion of the range of models available specifically for the Canadian market and with it a new range of Train Sets and Presentation Sets. Models for the Canadian market were manufactured at the Margate factory in England and production was normally in the first half of the year so the Canadian company had to place its orders by mid-April. Canadian Pacific liveries first appeared in the 1967/1968 Canadian Catalogue. But, only the R.55CP Diesel Locomotive and four Canadian Pacific passenger cars, in their striking silver-grey and maroon liveries, were introduced to the range. We would have to wait until 1969 before Canadian Pacific livery freight cars were to make an appearance. The Canadian company continued to assemble its own range of sets from both boxed and unboxed models sent out to them from Margate. Six new Train Sets and three new Presentation Sets featured in the catalogue. 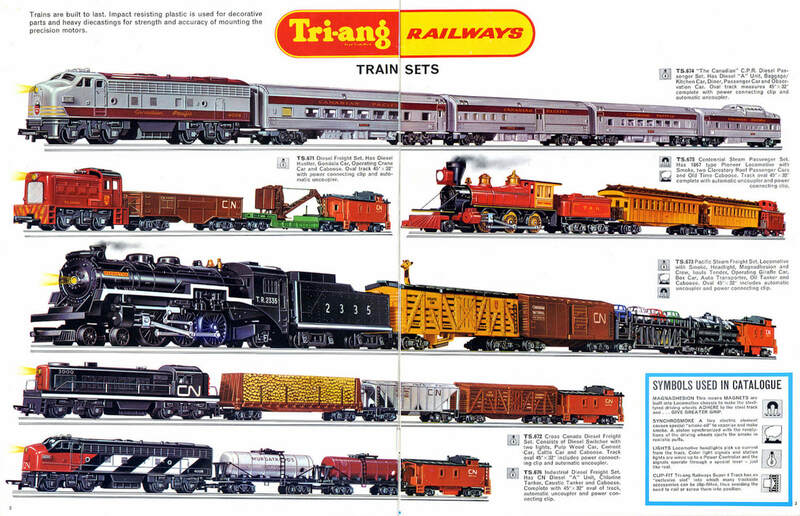 In addition to the Presentation Sets, the R.346 Stephenson’s “Rocket” Train continued in the catalogue and, although not illustrated, the R.641 Davy Crockett Set continued to be available but featuring only in the 1968 price lists.